There are parts of the world especially in Europe and many parts of the United States of America where travertine floors are more commonly used than in other parts of the world. Travertine is a quarried stone product that is cut to size and is similar in its make up to marble. 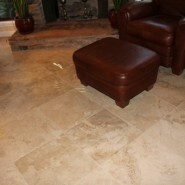 This topics goal is to provide our readers and visitors with the daily or routine steps for cleaning travertine floors. Relative to cleaning travertine floors, we are going to provide simple steps that anyone can perform with common household cleaning products and tools. So using a mop and bucket for cleaning travertine floors is fine and will do an adequate and fine job. With this stated, we are also aware that many residential homeowners are using other types of floor cleaning tools like Swiffer or Bona microfiber mops to clean floors. These types of flat microfiber mops will also perform well when cleaning travertine floors. The one thing that all residential homeowners that have travertine floors in their homes to realize is that travertine is very porous and perhaps more important is that travertine has many holes that appear black or dark. This is the characteristics of travertine and these holes go all the way through the travertine flooring. It gives the floor a special look and produces a handsome look to the floor. These holes are part of the beauty of the floor and should not try to be cleaned. It would be nearly impossible to scrub the darkening of the holes. Some travertine floors have the holes filled with an epoxy to seal them and make them level with the floor surface. This prevents soil from being trapped into the holes and an option that each homeowner should consider on whether or not to purchase a travertine floor that has the holes of the floor filled with epoxy filler. Begin by dust mopping the floor to remove loose debris with dust mop or sweep with a broom to remove most of the surface dust. Remove gum and other debris adhered to the floor with a Blunt Plastic Scraper. Wet or Damp mop entire floor using a mop and bucket method but we highly recommend using a microfiber flat mop cleaning system with a quality Stone or Slate Floor Cleaner or Neutral Floor cleaner using them according to label directions.